This latest addition to the successful Network Biology series presents current methods for determining the entropy of networks, making it the first to cover the recently established Quantitative Graph Theory. 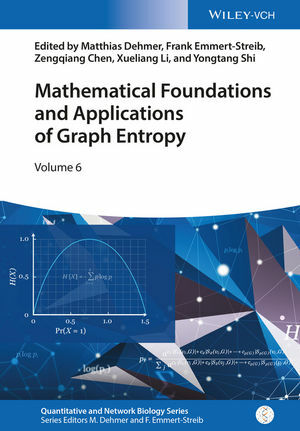 An excellent international team of editors and contributors provides an up-to-date outlook for the field, covering a broad range of graph entropy-related concepts and methods. The topics range from analyzing mathematical properties of methods right up to applying them in real-life areas. Filling a gap in the contemporary literature this is an invaluable reference for a number of disciplines, including mathematicians, computer scientists, computational biologists, and structural chemists. Matthias Dehmer studied mathematics at the University of Siegen (Germany) and received his Ph.D. in computer science from the Technical University of Darmstadt (Germany). Afterwards, he was a research fellow at Vienna Bio Center (Austria), Vienna University of Technology, and University of Coimbra (Portugal). He obtained his habilitation in applied discrete mathematics from the Vienna University of Technology. Currently, he is Professor at UMIT - The Health and Life Sciences University (Austria) and also holds a position at the Universität der Bundeswehr München. His research interests are in applied mathematics, bioinformatics, systems biology, graph theory, complexity and information theory. He has written over 180 publications in his research areas. Frank Emmert-Streib studied physics at the University of Siegen (Germany) gaining his PhD in theoretical physics from the University of Bremen (Germany). He received postdoctoral training from the Stowers Institute for Medical Research (Kansas City, USA) and the University of Washington (Seattle, USA). Currently, he is associate professor for Computational Biology at Tampere University of Technology (Finland). His main research interests are in the field of computational medicine, network biology and statistical genomics.